For Christmas of 2014, my hubby surprised me by adopting a sheep for me. In addition to naming her, about a year ago we got to visit her at the farm, too — if you missed it, definitely check out this post where I share the story & photos of this visit. Tami, who runs the farm, kindly coordinated with us so that we could visit when there were still a couple lambs being bottle fed so the kids could feed them. We got to see Annie, who was a little shy now with a lamb of her own, and meet all of the animals on the farm. Tami & I discussed Annie’s fleece during this visit and she asked if instead of shearing her in spring as planned if I minded if she held off shearing her until fall. Of course, I agreed. As the months went by, I received my farm updates from Tami and we were in touch on and off with specific updates on Annie. She indeed was sheared in the fall. My hubby has a lot of allergies and tries to steer clear of farm animals (which tells you how amazing he is to do all this and visit the farm with me), so I don’t do raw fleeces or wool. At my request & for a small fee, Tami had the fleece washed and carded. It was a process and one that I was fully prepared to be patient for and Tami was truly awesome about updating me all along the way. 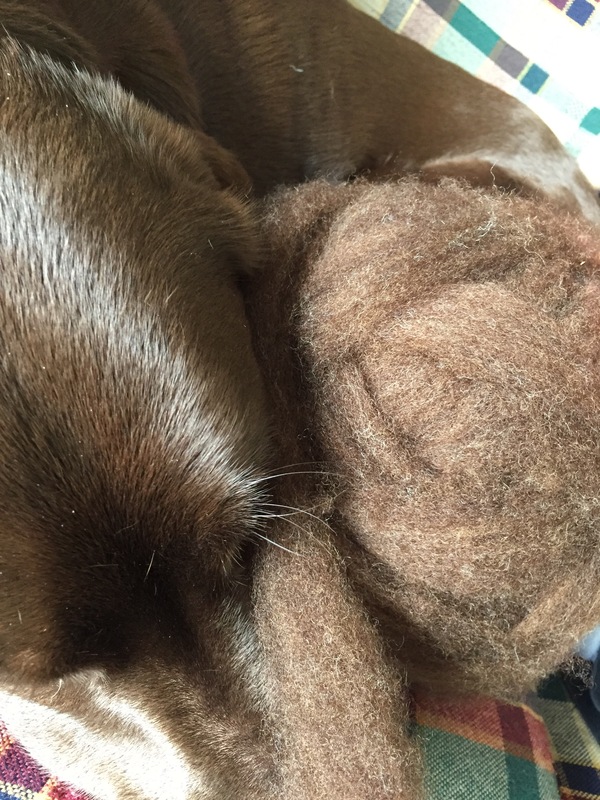 When the fleece arrived at the mill, she let me know the mill had a backlog. Based on what I’ve heard about how hard it is to find mills willing to do small batches these days, I was not surprised and — again — I was happy to wait. We’ve been in touch every month or so, since Annie was sheared and then early last week I got a response from Tami that was unexpected. She’s just gotten Annie’s wool back. All she needed to do was figure the charge for the washing & carding and she’d ship it. We took care of all that and the next day it was in the mail. Like a super nerd, I took a screen shot of the shipping notice & immediately texted it to my hubby. Then I did it again the following morning when I saw it had landed in my local post office. All the while, I dreamed of how much wool it would be. I knew it would be brown, but what kind of brown? How would it feel. I was truly like a kid on Christmas Eve. And on Friday, it arrived. 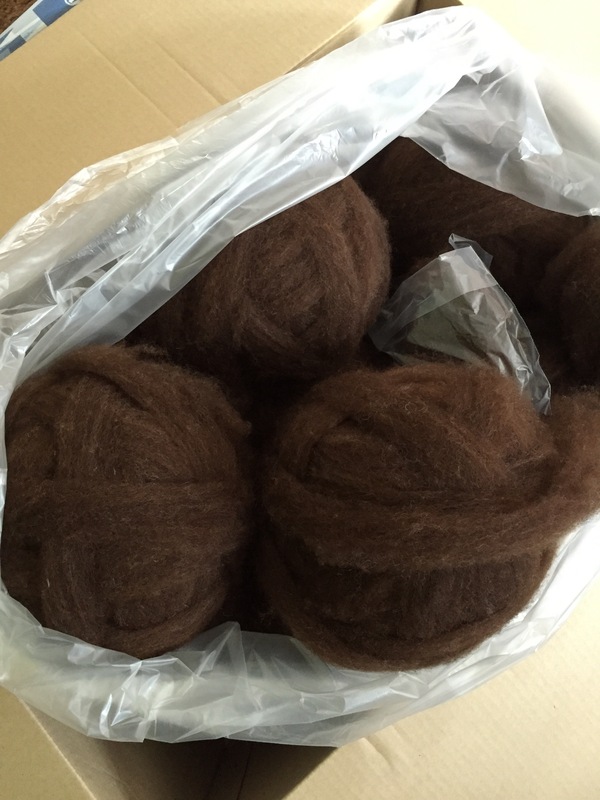 I opened the box to find about 4lbs of the richest, most lovely brown I could imagine. Moose is the standard by which I judge all browns, of course, and this one matches him so closely that throughout the day I had to do double-takes of the box because from the corner of my eye it looked like he’d crawled into it. Talk about perfect! You can really see the subtle variations here that are just sublime. I’m very, very happy with the washing & carding, too. This roving is definitely ready to spin. So how to spin it? I’m not 100% sure. I am sure that I’ll be doing some testing of this before I settle on a technique. I do, of course, hope to spin for a sweater of some sort. With this much wool it would seem silly not to. At this point, I’m thinking I will spin the yarn and then pick the sweater pattern. Knowing my skill level, if I listen to the fiber first the right sweater pattern will present itself. There are no shortage of options there. Having another spin in progress as well as numerous other things going on around here at the moment, I’m afraid that for the time being my biggest question is how to store this wool until I get to spinning it. The kids are already arguing over who gets to take the box and turn it into a time machine, but I think they’re going to have to wait for at least a little while. 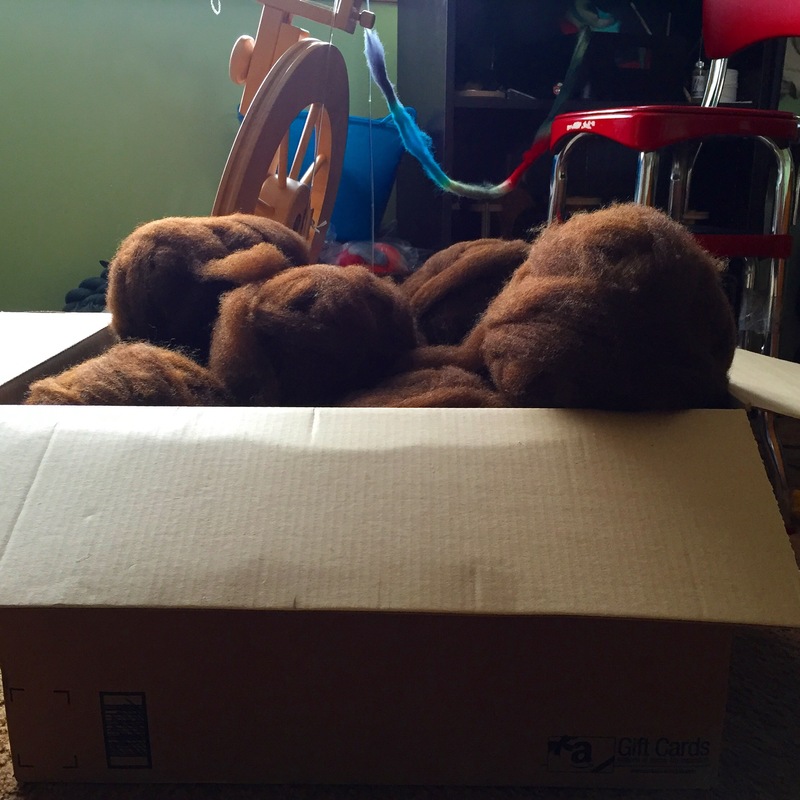 The giant box of wool is kind of glued to the vicinity of my wheel where I can stare at it’s contents. I’ve been waiting for the day when Annie’s wool made it home and I’m going to enjoy it. It was definitely, definitely worth the wait. Many, many thanks to Tami at Windridge Fiber Farm for her attentive care to her animals, her hospitality on our visit, and her patience in keeping me updated along the way. I could not be any happier with the outcome! If you’re interested in adopting a sheep & enjoying her beautiful wool, please check out the Windridge Fiber Farm website. There are opportunities in both their Adopt-A-Sheep program (where you get the wool) as well as Sponser-A-Sheep program (where you help provide older ewes with happy retirement). There’s a contact form right on the site if you have any questions. Four POUNDS? What fun! It’s a great story, too. I love the continuity of it all, from seeing Annie at the farm to spinning her fleece to eventually wearing a sweater made from it. Your husband is a rock star. Yes, four POUNDS. I bet if I tried I might be able to fit in the box it came in. I’m more than a little overwhelmed at the moment! It’s been such a fun journey — hubby gets major props, for sure! 😍 Goregeous fleece from Annie! What a special FO you are going to have and a great story to go with it! Thank you for sharing this experience. 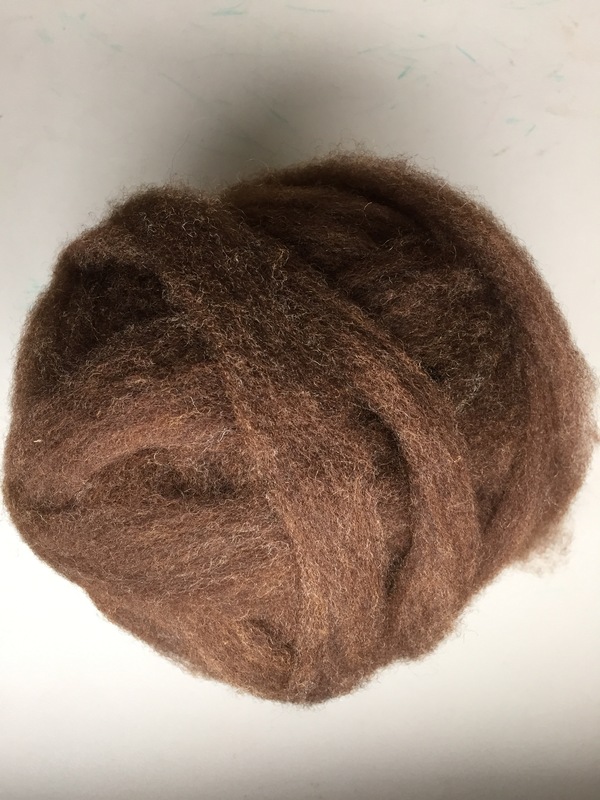 It added to my journey in wool appreciation and in understanding what it takes to make the beautiful, bouncy, squishy and soft yarn we all get to transform into something special. I just purchased “Farm to Needle” a book by Anna Dianich from Tolt Yarn and Wool. It profiles farmers, spinners, dyers and designers. I posted about it on my blog. A+ for your husband. I’ve heard of that title — you’ll have to tell me what you think once you dig in! What a wonderful story! I especially love the part about your children fighting over the box. (I am a box person, too, so can relate!) Your husband should be given a knighthood or Saint status or something! Can’t wait to see more about “Annie” as she continues to evolve. It really has been a joyful journey. I especially love that the whole family has been part of it. My hubby finds the best gifts! I am excited for you. When you first posted about your adoption, I looked at every picture, reread your blog, and made hints to Brian. When we visited his parents, we could take a break and visit a lamb. He didn’t fall for it, but I’m very happy that you now have this beautiful fleece. LOL! Believe it or not, I rarely get anything I hint at either! Thank you! And I agree, I’m never letting my mister go! Yay!! You have so much fun waiting to happen!!! I know! I’m still pretty much in the overwhelmed stages, but I’m very excited! Thanks! Yes, I’m a very lucky lady that this is a story I have to tell. I’m very excited to see this take shape too! That is so awesome! What beautiful fiber, I can’t wait to see what you spin with it. Thanks! With 4lbs, I kind of feel like what won’t I spin with it – lol!